These great tasting and oven baked Reload Protein Flapjacks from Grenade support your physique goals with over 22% protein in each bar. No fillers, added refined sugars or useless ingredients, just quality protein from a tri-source protein blend (soy, whey and casein), carbs from oats, oat bran and oligofructose (and more) and naturally occurring fruit sugars. The perfect way to consume high quality protein in-between meals, on the go, after training or whenever your macros demand a sweet treat which will not derail your diet. Chocolate Brownie flavour. Each bar is 70g. Can be consumed in between meals for additional protein in a convenient, great tasting bar. Oat Blend (Jumbo Oats, Rolled Oats, Oat Blend, Oat Bran), Oligofructose, Protein Blend (Soy Protein Isolate, Defatted Soya Flour, Whey Protein Concentrate (Milk), Casein Protein (Milk)), Invert Syrup, Rapeseed Oil [Vegetable Oil, Water, Emulsifier (E471)], Sultanas (4.5%), Dried Apricots (3.5%), Dried Cranberries (3.2%) Natural Flavour. 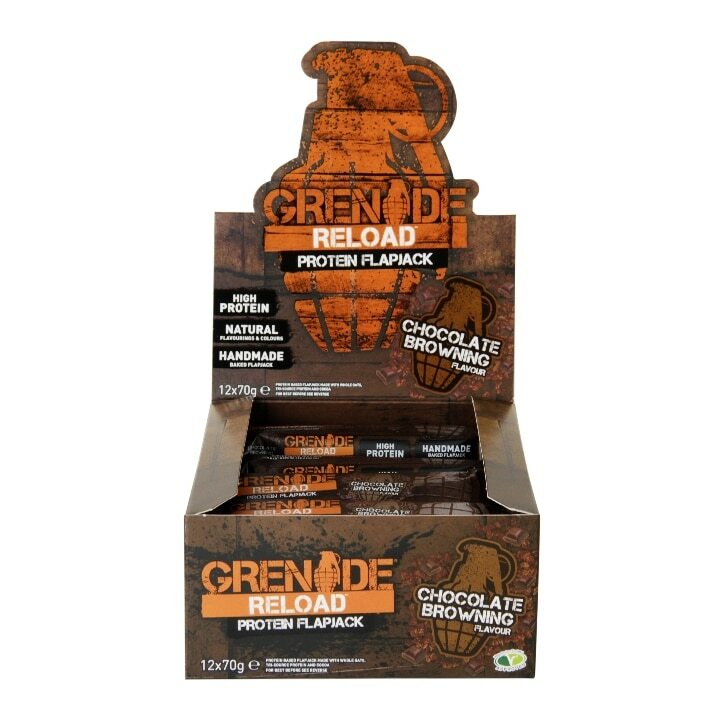 Grenade Reload Flapjack Chocolate Browning is rated 4.4 out of 5 by 12. Rated 3 out of 5 by Mr Right from I like chocolate but these are just a bit too much I’m going to struggle to eat all of this box I think any more than 2 is enough for a box. Rated 1 out of 5 by Doctormacca from Not great Not very chocolatey and doesn't taste great. Definitely wouldn't pay full price for this. Rated 5 out of 5 by Izzy31 from Delectable Bar These flapjacks have an enjoyable flavour and texture, which is unusual for a protein bar. The taste of chocolate is rich and sweet, without being sickly. The bar is moist and slightly crumbly. It holds its shape and it's easy to break off pieces to eat. Overall a delicious and satisfying snack. Rated 5 out of 5 by Ando from Tasty Treat I love these bars. After a hard training session they are a great way to start your recovery. They taste great, so I actually look forward to eating it during my training sessions. It is more like a reward, unlike some other protein bars that are more of a necessity but are a struggle to eat. They really do their job recovery wise as well.